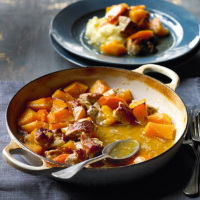 A quick to prepare winter warmer. 1. Preheat the oven to 180°C, gas mark 4. Heat 1 tbsp of oil in a large flameproof casserole dish. Add the pork, cutting any larger pieces in half to ensure even cooking. Fry the pork for 5 minutes to brown and seal. Remove the pork with a slotted spoon and set aside. 2. Fry the onion, squash and carrot in the remaining tbsp of oil in the pan for 5 minutes. Pour in the vegetable stock, bring to the boil and simmer for 2–3 minutes, uncovered. 3. Remove the dish from the heat, return the pork and season to taste. Cover and place in the oven for 35 minutes or until tender. Serve with mashed potato.